When you hear the words “video brochure” as a photographer, you may think this product is not for you. A PlayBook video brochure might just be your new favorite tool, however! It will give you the ability to put images in clients hands; a portable presentation that will wow them for year! And it doesn’t stop there! Everyone they show will want to know where it’s from. 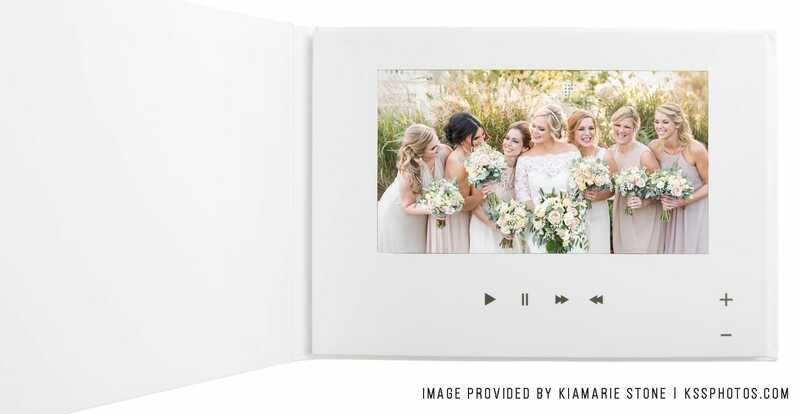 In this post we’ll discuss 8 ways that a wedding photographer can use a PlayBook video brochure in their business! This is the most common way to use the PlayBook as a wedding photographer. Not unlike the reaction you receive from delivering photos on a customized flash drive, the PlayBook will wow your client. Simply create a slideshow of the final images and drag and drop the video file onto the PlayBook drive. Pro Tip: I love creating slideshows with Animoto because they make it incredibly easy. Simply choose Memory Maker, upload your photos (they even have a connection with Lightroom! ), organize your photos in their movie maker, choose a song (which is already licensed so you don’t need to worry about that!) and export! After learning the platform and a cup of coffee, you can create a slideshow video in less than 10 minutes! Do you have a relationship with any venues who showcase your work to wedding couples? Create a marketing piece showcasing your photos and reasons why they will like working with you. Upload onto a PlayBook and leave it with the venue! Your photos will surely stand out with this presentation! Looking for a way to get your clients to hire you for more than your smallest package? We all are! Show them a sample PlayBook and offer it as a free gift if they choose a larger package! Be sure to include what the video brochure is worth so they understand the value! This one, hands down, is my favorite! If you are planning on attending a wedding show with the hopes of closing a few couples, record several testimonials from previous clients and make them available to watch in your booth! Testimonials have the highest effectiveness rating for content marketing at 89%! That means if you can’t physically take your previous couples with you to a show, this is your next best option! Imagine a potential client watching eyes light up and being able to hear the excitement in the voice of a past client. I’m sold already! Why would you recommend our services to someone? What is your favorite image I captured and why? Why did my style of photography fit you? You just photographed the wedding of your ideal client. Everything about them was perfect. You know what this means, right? They likely have friends and family who are just like them…perfect! Spending $99 on a gift may seem like a lot but it could be a small price to pay to book your favorite types of clients over and over again! They will surely show everyone your thoughtful gift and, as expected, their friends will ask where they got it! Looking for a unique way to explain your offerings? Use the PlayBook video brochure! Record a video detailing what the couple will receive in each offering. Incorporate photos of the physical products they’ll receive. Also include what they can expect from you as the photographer! For example, in the lowest priced package, you may work alone, but in the higher end packages, you may bring an assistant or two! Pro Tip: Using the PlayBook to explain your offerings also allows you the opportunity to ‘step away’ for a few moments while they watch the video. This takes the pressure off of your client and allows them to talk to each other without the need of a secret language! You book a wedding and know the couple wants to incorporate their dog into the wedding. You’ve photographed several weddings where dogs were included. Do you spend money and print these photos to have ready to show or do you create a slideshow of these images and drag and drop them onto the PlayBook? Using the PlayBook as your portfolio is ideal as you can easily change out what photos are showcased to your client. Rather than give away a mini session at a trade show in attempts to gain leads, give away a PlayBook to all couples who book with you! Have a few in your booth that they can play with and attach a value to it! After seeing what could be their wedding playing in their hands, they’ll definitely want to get more information from you! There is one thing we know for sure: incorporating a PlayBook Video Brochure into your business will make you stand out. As soon as your client has one in hands they’ll be wow’d. These are just a few ways that you can use a video brochure as a wedding photographer! How would you use it? Let us know in the comments below! This entry was posted in News and Updates and tagged business tips, Delivery Tools, PlayBook, Video Brochure.